We can now enjoy Starbucks coffee everyday minus the annoying, loud-mouthed coffee drinkers with their bare feet up on the chair. I do not have a coffeemaker and I'm not eager in owning one because I'm not actually a coffee drinker. My decaf coffee stays in the shelf for I don't know how long. My husband is the coffee drinker. He got excited when he found out about the Starbucks VIA Ready Brew. 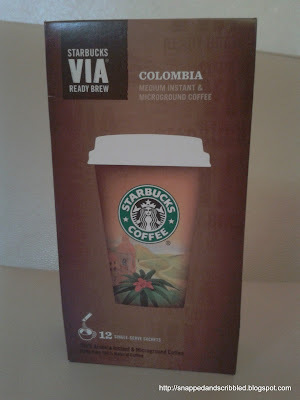 The flavour of Colombia -- anytime, anywhere. Grown in Colombia's rich volcanic soil, this coffee is as distinctive as the countryside. Starbucks VIA Ready Brew Colombia delivers round body, juicy mouthfeel and signature nutty flavour. We use 100% arabica beans to create a blend of instant and microground coffee. The result is a smooth and balanced, yet crisp, cup of Starbucks Columbia coffee. And because it's Christmas Season, A Christmas Blend is also available. Let's be merry, wherever we are. Starbucks VIA Ready Brew Christmas Blend begins when our signature blend of spicy and cedary aged Sumatran coffee meets mellow Asia/Pacific beans and lively coffees from Latin America. Much like good friends, they've been coming together in celebration every holiday for more than 25 years. We use these 100% arabica beans to create an instant and microground coffee that lets you enjoy a sweet, spicy cup of Starbucks Christmas Blend wherever the holidays take you. 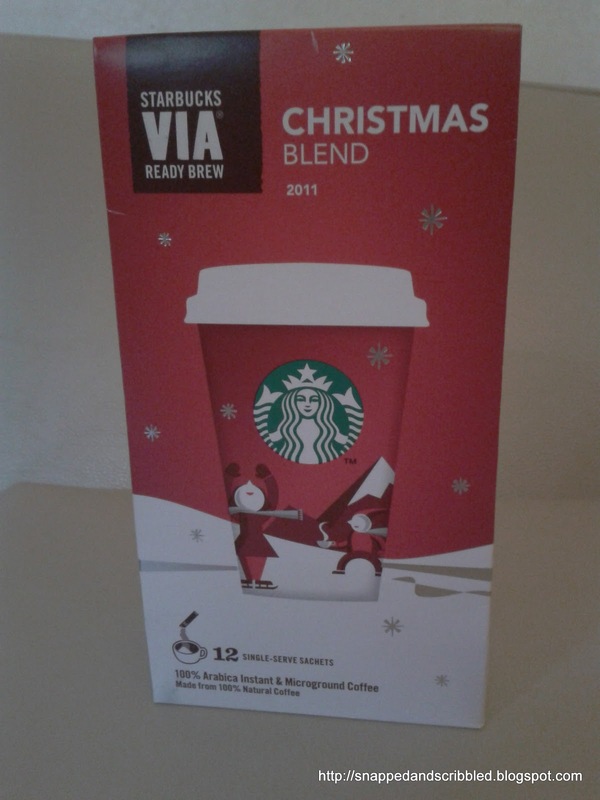 We'll be opening the Christmas Blend tomorrow. I hope the taste is as good as the beautiful packaging.